Mahalakshmi Yantra for Wealth and all Comforts of Life. To bestows wealth, prosperity and good fortune on the worshipper. It is very auspicious yantra for Wealth and comforts in life. 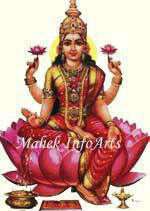 Devi Mahalakshmi is seated on blossomed Kamal flower. It is placed in cash box, almirah, purse or in temple of your house after worship (pran pratishta). It is embossed on copper plate and is 24 caret Gold plated . It must be offered puja with cleanliness and full confidence and faith. It brings success and wealth through regular puja and mantra chanting. It is believed that mere "Darshan" (sight) of this unique yantra in the morning blesses the person with Wealth. Always keep the blessing of Goddess lakshmi with you. Wear the unique silver pendant made by Astroshastra in silver , energized for you by lakshmi Mantra " Aum Shree Mahalakyamya Namah" to bestows wealth , health and prosperity on you. Maa Lakshmi is the goddes of wealth and each and every person in this universe wishes to have wealth , placing and pooja of lakshmi Yantra daily is the best way to appease Goddess Lakshmi.